Won't dent your kayak hull like the others. The new "Gull Wing" kayak carrier will outperform all others and fit 95% of all hull shapes. No other saddles have this much surface area to protect your kayak's hull shape against denting. Made of tough ABS plastic with a soft felt surface on top. Gull Wings are the only saddles that allow you to load from the side of your vehicle OR you can slide your kayak forward when loading from the rear of the vehicle. Other brand saddles actually resist sliding the kayak forward and make loading more difficult. This amazing "V" shape guides your kayak up and onto on to it's large 19" x 12" surface area. Our special Felt padded surface will allow you to SLIDE your kayak ON or OFF your rack with ease. · Gull Wing's "V" shape fits most 12' to 17' one person kayaks with sleeker hull shapes. Snap-Around Mount, Fits ONLY Yakima round bars OR Thule rectangular bars. Universal Mount, Fits most rack crossbar shapes up to 3" wide or up to 2" thick. Including Yakima Jetstream bars and Yakima Core bars, Thule Aero bars, and most factory racks. 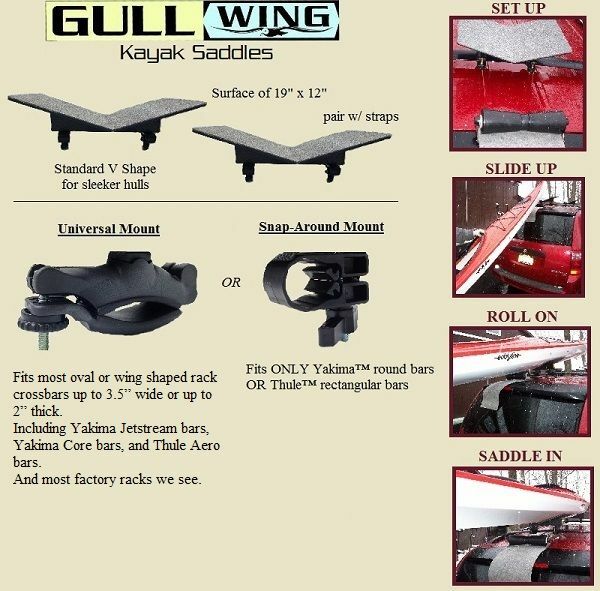 Gull Wing saddles fit any kayak with a rounded bottom (such as Old Town Dirigo or Current design Kestrel or Vision, also fits all sea kayaks OR any vee bottom Kayaks such as Wilderness Systems Tsunami or Pungo AND any Eddyline kayak. Click here for our Gull Wing and Gull Wing XL fit chart. Sold in pairs - one pair of Gull Wings carries one kayak when mounted to your vehicle's rack or crossbars. Two 10ft over the hull tie-down straps are included but we also recommend four of our bow/stern straps (either 8ft or 6ft). Reg. $200. SALE: $179.95 /pair.